If you’ve ever picked up a sewing pattern, you may have been confused by the apparent hieroglyphics marking on the pattern pieces. Never fear – you don’t have to learn an ancient, symbolic language in order to sew with commercial patterns! Most patterns have standardized markings, which makes it easier and faster to sew with them over time once you have practiced with a few of them. Let’s take a look at the magic decoding key. Let’s break the glossary down into bite size chunks. Cutting Lines – The cutting lines on a pattern are the lines you use when cutting out the pattern pieces (first cutting them out of the paper pattern and then cutting them out of fabric. If a pattern comes in one size only, usually the cutting line is a solid line and the seam lines (where you would sew on the fabric) are dotted or dashed. If a pattern comes in multiple sizes, the cutting line uses a different design or style for each size (so a size 8 might be solid while a size 10 is dashes and a size 12 is dots, for instance). When cutting out patterns like these, be sure to cut along the correct line! In these cases there generally isn’t a seam line; rather, the pattern instructions simply tell you how large to make the seams. Grainline Mark – This mark is a horizontal line with arrows pointing out on either end; line this up with the grain of your fabric as you position your pattern pieces. (The grain of your fabric is parallel to the selvege edges). On the Fold – Represented by a line with arrows pointing in a particular direction, the “on the fold” marking shows you where to position the edge of your pattern piece on a fold of your fabric. This allows you to cut a piece of fabric that is twice as large as the pattern piece. Bust and Hip Indicators – The bust and hip indicators are small circles with crossed lines in the center. You’ll find these pattern markings positioned at the bust and hip points on the pattern pieces, and they will be accompanied by a measurement of the full circumference of the pattern at these points. They’re an easy way to make sure that the finished pattern measurements will work well for your own bust and hip measurements. Notches (Diamonds and Triangles) – There are often markings shaped like diamonds or triangles along the edges of a pattern to indicate where you need to match up two pattern pieces and fit them together. Squares, circles, and other shapes – These small shapes are usually positioned at the neckline or armholes of a pattern (though they can technically show up anywhere). These are used to indicate the point at which you should match up two pieces of the pattern, such as fitting a sleeve into an armhole. Lengthen/Shorten Line – Often a pattern has two horizontal, parallel lines together to indicate the point where you might wish to lengthen or shorten the pattern in order to suit your own measurements. This is especially true when a pattern has a petite size option. Buttonholes and Buttons – The position of a buttonhole on a pattern is usually represented by a line shaped like a capital “I,” whether it’s vertical or horizontal. Along this line somewhere will be an X to indicate the placement of the actual button. 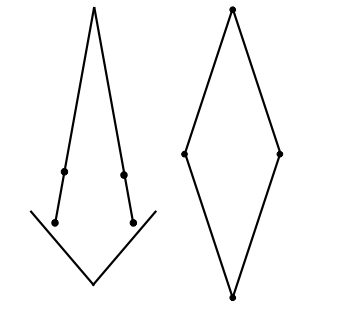 Darts – Dart lines on a pattern are usually shown as a diamond shape or as two lines spreading out from one concentric point. The dart lines often have dots on them to help you line up the stitching. Tucks and Gathers – these markings resemble a square that is missing one line; the dots at the bottom indicate where to pull in the fabric to make it meet in the middle, and the vertical lines and dots at the top indicate where to sew your stitches. Pattern Key- These squares refer to your printed pattern. They are designed to keep your pattern right side up or down when cutting. Be sure to match this to your pattern cutting instructions. Fabric Key- These squares refer to your fabric, interlining and lining. They are designed to keep your fabric placement in check. Have you ever encountered a strange symbol on a sewing pattern that we haven’t covered here? Snap a photo and share it with us, and we’ll help you figure it out! 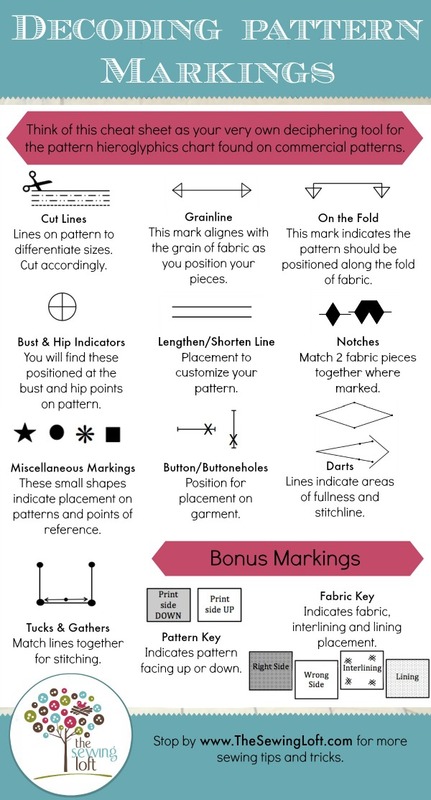 ps- You can grab a printable copy HERE or Pin This pattern markings info graphic for a quick reference during your next sewing project. I just wanted to let you know that I followed the link to Craftsy and the printable page there cuts off the bottom of the markings. Thank you Hazel! I have reloaded the file again in Craftsy and it should be fixed now. You can grab it from your pattern library and download it again. Thanks! Pinned to my Pinterest boards for future reference. Someday my bulletin board will be mounted and I will print out for an easy visual reference about my cutting table. Thanks Anne- I love the way it turned out!